Established in 1880 by English residents of Lisbon, it was only in 1964 that the club took up its permanent home, the Casal da Carregueira, which is in Belas, some 15 kilometers from Lisbon. 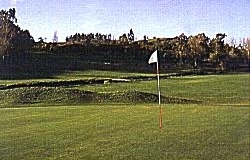 The course, which originally had only 14 holes, has recently been enlarged to 18 holes. Its overall length is now 5,233 meters for a Par 69. Crossed by a stream that influence the game on at least 12 holes, the round starts out with a Par 3. A number of difficulties - woods to the left, stream on the right, and bunkers on both sides - challenge the player even with his first shot. Then, before the golfer is properly warmed up, he has to face another Par 3, though this time with even greater difficulties because of its 180 metre length. Up until the final hole (a tricky Par 4 crossed in the middle by the stream) the player can enjoy unforgettable contact with nature, and admire the cypresses, the eucalipti and wild flowers, while at the same time facing up to shots that tax his imagination. The original house on the property has been converted into the clubhouse. 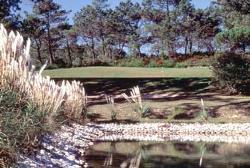 Its colonial style is very welcoming, and from its terrace one can see the fairways of holes 5 and 18. Facilities: Driving Range, Putting Green, Pitching Green (with bunkers), Trolleys, Caddies, Club Hire, Pro-shop, Children's Nursery, Restaurant, Bar, Tennis Courts, Sauna, Swimming Pool, Golf Shop.